Volunteers are the heart and soul of TROT. They help students groom and saddle their horses; assist and support the student as side walkers and leaders during each lesson; and assist in barn duties. 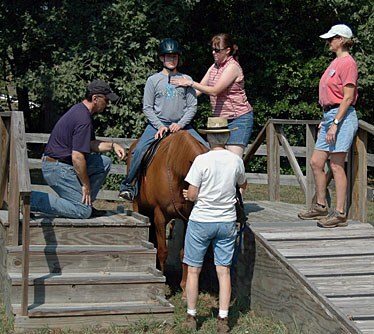 Volunteers also carry out administrative tasks and provide valuable assistance to the instructors and other TROT staff. While experience with horses is valuable, it is not a requirement. Volunteer training is held twice each year. Each candidate is required to attend an introductory class on equine assisted activities and therapies and at least one hands-on training session, working with a horse and a rider simulating a number of disabilities and emergency situations. Please note that volunteers wishing to serve as sidewalkers and leaders during lessons must also meet certain physical criteria. They must be able to walk on uneven ground for up to thirty minutes and be able to jog for up to five minutes. They also must be able to hold one arm at shoulder height or higher for the same period of time, and be physically capable of responding to emergency situations involving horse and rider.